The Battle of Waterloo, June 18th, 1815 - Just in time for the 200th anniversary of the battle! This is "the battle" to fight for miniature wargamers. 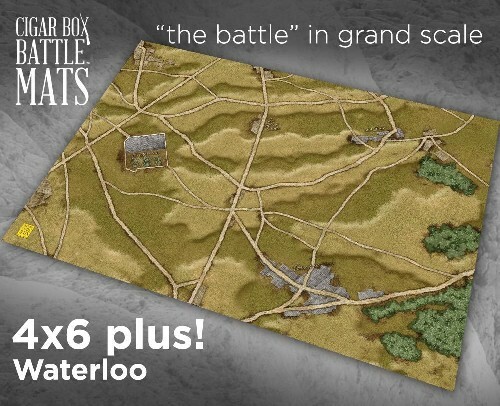 Fight the entire battle of Waterloo on this detailed grand-scale terrain mat based on historical maps and featuring all of the key roads, ridges and built up areas. Play with the mat "as is" or add your own buildings, woods and figures and you are ready to play! • approximately 1 inch to 100 yards - perfect for grand-tactical scale wargaming. We recommend 2mm - 15mm scale figures or Sam Mustafa's card based game "Blucher". The Hougoumont area size is slightly exaggerated due to it's tactical significance in the battle.